An Anti-Statist Communist Manifesto, which was first published in 1887, was the most important writing by Joseph Lane, who was one of the little-known founders of the libertarian socialist movement in Britain. Lane came from the rural working class. He was born on 2 April 1851 in the village of Benson near Wallingford, between Oxford and Henley. According to his birth certificate, his father was a cordwainer (an old word for shoemaker - Carlyle calls George Fox a "poor cordwainer" in Sartor Resartus), and his mother was illiterate. Lane had virtually no education, and from an early age he worked on the land. At an early age he also developed an interest in radical politics. He later recalled that during the General Election of July 1865 he "attended all political meetings in Borough of Wallingford," and questioned the successful Liberal candidate, Sir Charles Dilke, about the abolition of the Game Laws and the House of Lords. This would identify him in the British populist tradition associated with the Chartist leader Bronterre O'Brien, who had died in 1864 but whose followers remained influential in working-class politics for another two decades. Lane came to London soon after this. He witnessed the National Reform League demonstration in July 1866, and later recalled seeing the "Hyde Park railings down," when angry crowds broke into the park to establish the right of public meeting there an event which hastened the passage of the second Reform Bill, extending the vote to most working-class men in urban areas. In London Lane worked as a carter, but he managed to fit an increasing amount of political activity into his spare time. During the early 1870s he seems to have been involved in the Land Tenure Reform Association led by the radical philosopher John Stuart Mill (Liberal MP for Westminster) and in the republican campaign led by the radical politician Sir Charles Dilke (Liberal MP for Chelsea, and son of the former Wallingford MP). Lane was later said to have accompanied Dilke on one of his speaking tours and to have been nicknamed "Dilke's Boy." He was also later said to have belonged to an English section of the International Working Men's Association and to have supported the Paris Commune in 1871, but this seems to derive from a misunderstanding of his later activities. There is no evidence that Lane began to move beyond radicalism before the end of the 1870s. By 1880, however, Lane was involved in several working-class organisations in central London which played an important part in the transition from radicalism to socialism on the British left. The first organisation was formed as the Democratic and Trades Alliance Association in 1874, and became the Manhood Suffrage League in 1875. Its members included several old Chartists, and from 1874 to 1877 its secretary was Frank Kitz, a leading activist in radical, socialist and then anarchist politics for nearly half a century. Lane is first recorded taking part in the discussion in the meetings at the Queen's Head in Little Pulteney Street in January 1879. The second organisation was the English Section of the Social Democratic Club, which was formed by Kitz in 1877 to link native radicals and foreign (mainly German) socialists living in exile in London, and which acquired its own premises in Rose Street. Its German Section was dominated by Johann Most, a former Socialist Deputy in the Reichstag who produced Die Freiheit, which began as a socialist weekly in 1879 but turned towards anarchism during 1880. "I said, "Yes, and House of Commons too. "Result - they threw all they could lay their hands on at us on the platform, and smashed up furniture and mirrors." The Marylebone radicals rejected a Conservative offer to pay for a radical candidate to split the Liberal vote. But a former Conservative called H.M. Hyndman did offer himself as an independent candidate, with a programme of liberalism at home and imperialism abroad, and he tried to get radical support too. Lane refused, later recalling that "I told him it was only a waste of time." But when Gladstone's new Liberal Government soon disappointed radical hopes, some of his comrades continued discussions with Hyndman, and the result was the formation in June 1881 of the Democratic Federation, a coalition of middle-class and working-class radicals under Hyndman's leadership, working towards an independent labour party with a policy inspired by Karl Marx (whom Hyndman had just read and met). Lane was involved in the beginning of this process, but soon turned to other activity. In March 1881 he was involved in the Freiheit Defence Committee, which was formed when Most was arrested for welcoming the assassination of the Tsar in Die Freiheit. As well as raising public support for press freedom and arranging a legal defence for Most (who got sixteen months' hard labour), the committee produced seven issues of an English Freiheit from April to June, edited by Kitz and published by the English section of the Social Democratic Club. At the same time Lane was involved in producing and distributing The Radical, a leftist weekly produced by Frank Soutter and Samuel Bennett from 1880 to 1882. Early in 1881, Lane moved to East London, where he spent the rest of his life. He first settled in Hackney, forming a new club, which was called the Socialistic Working Men's Association in May, the Homerton Section of the Social Democratic Club in June, and the Homerton Social Democratic Club in July. Its original affiliation was with the Rose Street Club, which supplied it with some literature, but it soon became independent. From the start it was unequivocally socialist, and Lane practised the same politics as he preached. He acquired a printing press to produce his own literature, and later recalled that he "used in my room to write leaflets, then set them up, and went out and distributed them and pasted them up in the streets," organising a "paste pot brigade to stick bills all over the district." The Homerton club held meetings on Sunday evenings at the Lamb and Flag in Homerton High Street, until they were stopped at the beginning of 1882. It was reported by The Radical that the police "threatened the landlord of the Lamb and Flag with the loss of his licence if he did not get rid of his obnoxious tenants" (4 February 1882), and Lane later recalled that "the police inspector said because we printed Socialism so large on our bills." He complained to Scotland Yard and the Home Office, but got no redress. For the next few months the club's press notice read : "Shut by order of the police." Lane was one of two delegates sent by the Homerton Social Democratic Club to the International Revolutionary Congress in London in 1881. Private meetings were held at a public house in Charrington Street, Somers Town, during the third week in July; and a large public meeting was held at the Cleveland Town Hall on 18 July. Although the six English delegates were not anarchists, most of the forty foreign ones were, and Lane recalled that he met "Kropotkin, Malatesta, etc." The Congress confirmed the policy of propaganda by deed, following the repression of socialist propaganda by any other method throughout Continental Europe, and tried to re-establish a socialist international. The English delegates were not reported to have said much in the proceedings, but when the American delegate Miss M.P. Le Compte accepted Lane's invitation to speak at the Homerton Club she wrote that it had "proved its spirit at the International Congress" (12 August 1881). And blessed be the hand that dares to wave The regicidal steel that shall redeem A nation's sorrow with a tyrant's blood! This militant activity soon brought results. In 1882 Kitz and Lane joined Ambrose Barker and Tom Lemon of the Stratford Dialectical and Radical Club in forming the Labour Emancipation League, based at Mile End and Bethnal Green, which soon became the most important working-class organisation in the growing socialist movement. Its programme included six traditional radical points (adult suffrage and secret ballot; direct legislation by referendum; abolition of standing army; free secular education; freedom of speech, press and assembly; free administration of justice) and two definitely socialist ones (equalisation of wealth; socialisation of production). When the first secretary, Aaron Moseley, soon resigned Lane took over and established himself as the most effective socialist organiser in London. His old organisation was not completely superseded by the Labour Emancipation League. It continued to exist as the Homerton Socialist Club, and Lane was one of its two signatories to the Manifesto to the Working Men of the World, an unsuccessful appeal for the re-establishment of the International Working Men's Association which was issued by the London socialist organisations in July 1883. Lane never achieved much of a reputation as a writer or a speaker. Most of his writings were anonymous ephemera. In 1887 William Morris wrote that "his obvious earnestness and good faith make him a convincing speaker," but the Liberal Daily News described him as "a humble sort of man" who "dropped his h's recklessly" (17 March 1887). George Cores later recalled : "Joe Lane had a peculiar style of speaking. He used to close his eyes and slightly sway his body while holding forth." His real gift, which everyone acknowledged, was for the organisation of agitation and propaganda, and it was in 1882 that this really bore fruit. Lane later recalled : "This my mode of operations. Take a room, pay quarter's rent in advance, then arrange list of lecturers for the three months, then get bills printed, one for each week, then each week paste up bills in streets all around. By the end of the three or six months I had got a few members and got them to take it over and manage it as a branch. I had generally two or three branches on my hands at once". Such branches quickly spread in East London, and the Labour Emancipation League extended its activities into Central and West London, bringing socialist ideas into the open at both indoor and outdoor meetings, and breaking into national politics. Meanwhile the coalition of the Democratic Federation had begun to break up. In 1882 it turned towards socialism, and in 1883 it adopted an openly socialist programme, losing its pure radicals and gaining William Morris. 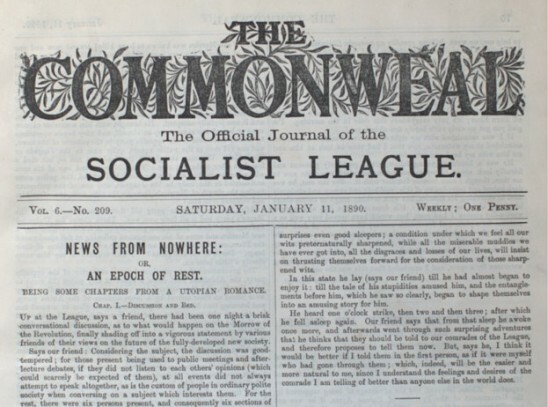 In January 1884 it began publishing Justice, the first socialist weekly in Britain, and began working more and more closely with the Labour Emancipation League. Lane helped to distribute Justice, and agreed to arrange for delegates from the Labour Emancipation League to attend the annual conference of the Democratic Federation with a view to affiliation. In August 1884 the Democratic Federation changed its name to the Social Democratic Federation, and adopted most of the programme and absorbed most of the leadership of the Labour Emancipation League. Lane was elected to the new Executive Council, and immediately joined the opposition to Hyndman's authoritarian leadership, becoming a member of the caucus round Morris. The new coalition lasted only a few months, and by the end of the year the Social Democratic Federation split into an authoritarian minority led by Hyndman and an anti-authoritarian majority led by Morris. In December 1884 the majority seceded rather than expel the minority, and formed a new organisation called the Socialist League. Lane signed both the statement explaining the split, To Socialists, and the Manifesto of the Socialist League, and he joined the Council of the new organisation. He brought with him most of the membership of the Labour Emancipation League, and also his printing press. He became the manager and joint publisher (with Morris) of the Socialist League paper, The Commonweal, and was also an occasional contributor from the first issue - when he wrote on "East End Workers" (February 1885). He remained a leading figure in the Socialist League for four years, but he was often unhappy in it, resigning after personal differences temporarily from the Council in 1885 and permanently from the League itself in 1889. He later recalled that he had made "a fatal mistake" in transferring his activities to the Socialist League, and that he was "very sorry" he had not stayed with the Labour Emancipation League: "We should have had a very strong organisation in the East End of anti-state socialists." But for a time he took a significant part in the struggle. Not that it was all struggle. In February 1887 Lane represented the Socialist League at an international socialist "feast" in Paris, for example, and in March 1887 he and his wife were invited to Morris's house in Hammersmith to watch the University Boat Race! The Socialist League was itself yet another coalition, united at first mainly by hostility to Hyndman, and it soon developed parliamentarist and antiparliamentarist fractions, "which are pretty commensurate with the Collectivists and Anarchists", said Morris, who tried to hold the balance between them. At the first annual conference in July 1885, a draft parliamentarist constitution inspired by Engels was rejected, and abstinence from electoral activity was confirmed. (The Social Democratic Federation put up two candidates in the General Election of November 1885, paid for by Conservative money to split the Liberal vote. The Socialist League produced a leaflet, For Whom Shall We Vote?, concluding : "Do not vote at all!") At the second annual conference in July 1886, the antiparliamentarist policy was reaffirmed, but the parliamentarist fraction began to turn into a faction, working secretly to win branches over to a parliamentarist policy. The Council itself was so deeply divided that it appointed a subcommittee in November 1886 to draft a new policy statement for the 1887 annual conference. The policy subcommittee had two members from each side - Ernest Belfort Bax and Thomas Binning for the parliamentarists, J.L. Mahon and Lane for the antiparliamentarists. They managed to reach agreement about everything except the Eight Hour Day and Parliament itself, so Mahon offered to draft compromise policies on these issues. When he produced the result of his work, Lane later recalled, "to my surprise" he had "done a right about face and joined the other two, leaving me to defend the position alone." When the other three presented their majority report to the Council, in March 1887, Lane insisted on presenting his own minority report as well. In April the Council decided not to print either of the "rival manifestoes," as Morris called them, commenting privately that Lane's was "a long lecture not at all fit for its purpose." Lane therefore arranged to print his draft on his own responsibility, later commenting that "like another Joseph I was not going to take it lying down." He got some support from Morris, who helped to pay for the printing, and also from Morris's old friends Charles Faulkner and Philip Webb; the latter added in his letter : "Keep your pecker up, and do not go off in a puff of spontaneous combustion" (21 May 1887). He circularised the branches of the Socialist League, though Morris persuaded him not to give up his job and tour the country to raise support. In the event the third annual conference in May 1887 rejected both manifestoes in favour of Morris's "shelving resolution," which repeated the original antiparliamentarist policy and postponed the decision for another year. The parliamentarists immediately began to organise their faction, and Lane published his manifesto in June, calling it An Anti-Statist Communist Manifesto as a gesture of defiance against the Marxists. It was a penny pamphlet printed by W.J. Ramsey, a well-known secularist who had been imprisoned for blasphemy as publisher of the Freethinker in 1883. It was given an epigraph from Edmund Burke's satirical Vindication of a Natural Society (1756), which was often taken as a text of philosophical anarchism and which had been reprinted by Benjamin Tucker in the United States in 1885. It was intended to be the first of an International Revolutionary Library, and it announced : "Pamphlets dealing with the various phases of the Social Question in all countries from a Revolutionary standpoint will be issued at regular periods." Unfortunately they were not. Lane defended liberty, equality and solidarity - what would now be called libertarian socialism. He attacked authority, whether religious or political, and declared himself both atheist and anti-statist neither God nor master! He avoided the word anarchist, preferring to call himself a revolutionary socialist or a free communist. He opposed both mere radicals and mere secularists, both individualist anarchists and collectivist socialists. He opposed Parliament as a symbol of what was wrong with public life and marriage as a symbol of what was wrong with private life (though he was himself happily married with several children). He rejected such panaceas as imperialism and emigration, co-operation and land nationalisation, teetotalism and vegetarianism, or so-called Malthusianism (birth control), and such palliatives as a legal eight hour day or public relief far the unemployed. He attacked the welfare state as well as the warfare state. He wanted social revolution, not social democracy. The manifesto was advertised in The Commonweal and later sold by the Socialist League, but it was not reviewed in Lane's own paper. It was, however, reviewed by two other papers on the left. The collectivist socialist Our Corner, edited by Annie Besant, said : "Mr Lane is extravagant in many of his statements, but his pamphlet is quite worth reading" (August 1887). The anarchist communist Freedom, edited by Charlotte Wilson, said it was "an energetic and earnest exposition of Anarchist Socialism from a worker's viewpoint" (August 1887) : "But is it not a pity to use the somewhat clumsy title Anti-Statist rather than the more definite and expressive Anarchist? Why evade the fine old name which for years has rung out in the van of the Socialist movement throughout the world? ... Let us bear our title of Anarchist proudly in the sight of all men". Lane was in a difficult position. Like Morris, he was a convinced antiparliamentarist but not a complete anarchist. Like Morris, he used the word as a synonym for individualist. Yet his position is hard to distinguish from anarchism. As Max Nettlau later commented: "His anarchism was the logical consequence of his consistent socialism." There was no longer any need to avoid the term in 1887. Two American papers, The Anarchist and Liberty, had imported anarchism into Britain since 1881. Two British papers, The Anarchist and Freedom, had naturalised anarchism since 1885. The fourth Fabian Tract What Socialism Is (1886), gave anarchism the same status as collectivism. While Lane was writing An Anti-Statist Communist Manifesto, Henry Seymour was writing The Philosophy of Anarchism and Peter Kropotkin was writing the Nineteenth Century articles later reprinted as Anarchist Communism. Presumably Lane was reacting against the accusations of the parliamentarists that he was advocating mere anarchism, and possibly he was also reacting against the middle-class intellectuals who were advocating their anarchism. He remarked later : "I do not claim that I have expounded anarchy; it is for others to judge." And he returned to the problem twenty-five years later in a letter to Ambrose Barker which praised not only the open anarchists but also the syndicalists for doing "good work among the Trade Unions in the same direction without frightening them with that terrible word Anarchy" (17 December 1912). Later in 1887 the political situation was sharpened by two dramatic events - the police riot known as "Bloody Sunday" in London, and the judicial murder of the Chicago anarchists, both in November. It is not surprising that the parliamentarist faction was finally driven out of the Socialist League at the fourth annual conference in May 1888; and it is appropriate that Lane helped to expose its intrigues, involving all three signatories of the majority report of 1887. But the Socialist League remained an unstable coalition, and the antiparliamentarists soon began to split between the anarchists and the rest, including Morris and Lane. Lane remained active for a time, though he was in bad health, helping to organise a new East End Socialist Propaganda Committee in spring 1888 and a Chicago Commemoration Committee in autumn 1888. But in May 1889 he quietly resigned from the Socialist League, and in November 1889 he just as quietly ceased to be named as publisher of The Commonweal. Morris tried to change his mind, writing : "I always looked upon you as one of the serious members of the League" (21 May 1889). Morris himself left in 1890, and the League was dissolved in 1895; Lane's old press went to the Freedom Press, which used it until 1927. Lane never returned to the socialist movement, but he kept in touch with some of his old comrades. He moved to Forest Gate, and during the decade before the First World War he produced occasional political leaflets, though he no longer printed them himself. One attacked Joseph Chamberlain's campaign for tariff reform during the General Election of 1906; another attacked Hyndman's claim to have founded British socialism in 1912. Yet another was a remarkable reversion to the agrarian populism of the old days -- An Open Letter to Baron de Forest, MP for West Ham, or any other Public Spirited Member of Parliament who will take up THE LAND QUESTION on behalf of the People. (This has previously been dated to the 1870s, but de Forest became MP for West Ham only in 1911, and it probably dates from 1912). Joseph Lane died suddenly on 3 September 1920. A decade later Max Nettlau, who had known him in the Socialist League, wrote in his history of anarchism : I consider him to be the best head English socialism possessed in the years from 1879 to 1889, and I regret that his activity came to an end - not through his fault - in the first months of 1889; a man like him has been lacking from that time to this. Half a century later, that epitaph stands unchanged. The available material about Joseph Lane which has been published in studies of British anarchism and/or socialism is incomplete and/or inaccurate. The following sources are the most valuable : The many contemporary periodicals - local, radical, secularist, socialist, anarchist (British Library). The documents of the Socialist League (Nettlau Collection, International Institute of Social History, Amsterdam). Some manuscripts of Joseph Lane and William Morris (John Burns and William Morris Collections, British Library). Some memoirs by participants - Joseph Lane (Nettlau Collection, International Institute of Social History, Amsterdam); Frank Kitz (Freedom, January - July 1912); Mat Kavanagh (Freedom, October 1934). George Cores (Direct Action, November 1952-July 1953); Ambrose Barker (Vestry House Museum, Walthamstow). But all these were written after a long time and with a strong bias, and must be treated with caution. The following books are useful but unreliable : Max Nettlau : Anarchisten und Sozialrevolutiondre (1931, 1972). Henry Pelling : The Origins of the Labour Party (1954, 1965). E.P. Thompson : William Morris : Romantic to Revolutionary (1955, 1977). George Woodcock : Anarchism (1962, 1963,1975). Stan Shipley : Club Life and Socialism in Mid-Victorian London (1972). John Quail : The Slow Burning Fuse (1978). Acknowledgement is due to the British Library, London, and the International Institute of Social History, Amsterdam; and also to John Quail, Stan Shipley, Ken Weller, and Martyn Everett.